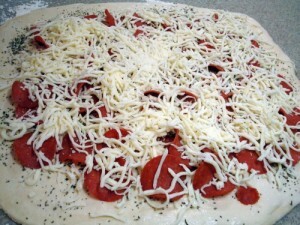 When I go out to the local pizza joint with my dad for lunch, it’s inevitable that the servers give us “that look”. That look where they kinda pull their eyebrow down to corner of their lip on one side (which is coincidentally the same look my dog makes when she’s trying to reach a scratch behind her ear) and you can almost hear the “Huh?” going on in their brain. It isn’t like I’m weird or anything. Not really, at least. I just like things the way I like them. Take today for instance… Dad and I split a sub. 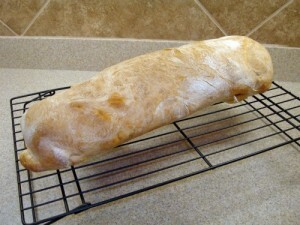 His half: Turkey, cheese, lettuce, tomatoes, yellow mustard. 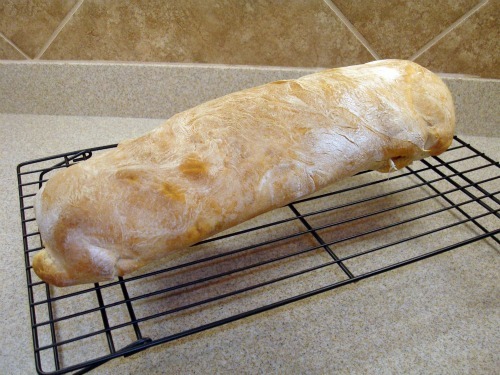 My half: Turkey, cheese. And it better be on plain white bread or I’m not eating it. 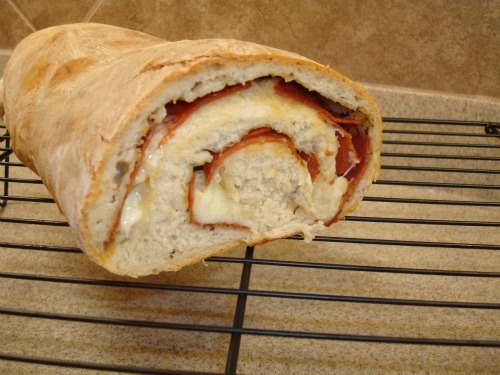 And there better not be any mustard on it. 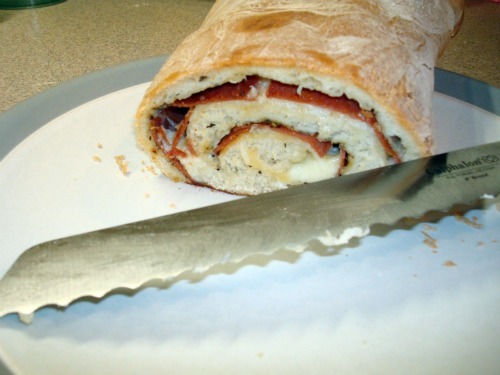 Serves: I got about 7 good thick slices, plus the ends. 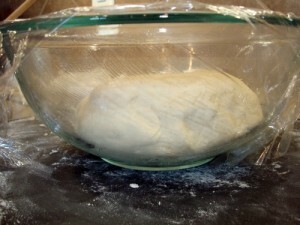 Pour the water into a large mixing bowl and sprinkle the yeast over it. Once the yeast starts to dissolve (about 5 minutes) add the sugar and oil. Whisk mixture to blend and set aside for 5 minutes. 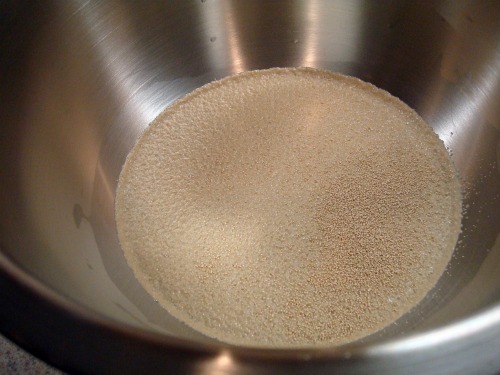 Stir the salt into the yeast mixture and add 2 cups of the flour. 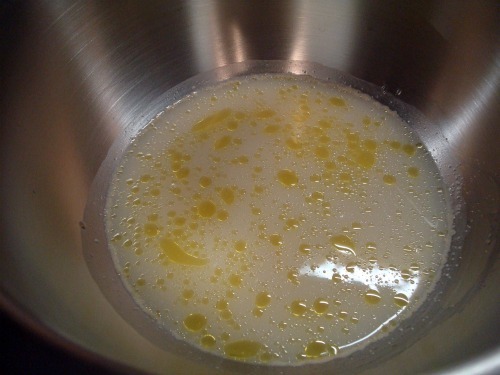 Beat well with a wooden spoon, about 25 good continuous strokes. 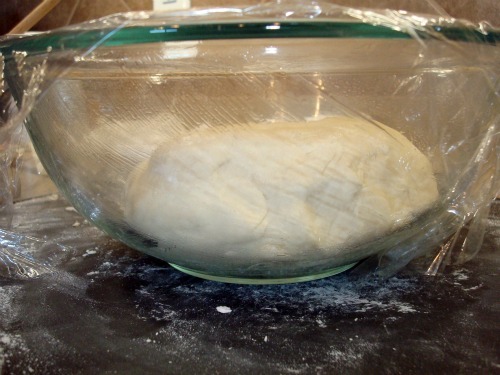 Add the rest of the flour about ¼ cup of the time, beating well after each addition until the dough is firm and no longer sticky. Transfer the dough to a flour-coated work surface. Punch down the dough several times with your fist, then turn it back onto the floured surface and knead for about 1 minute. 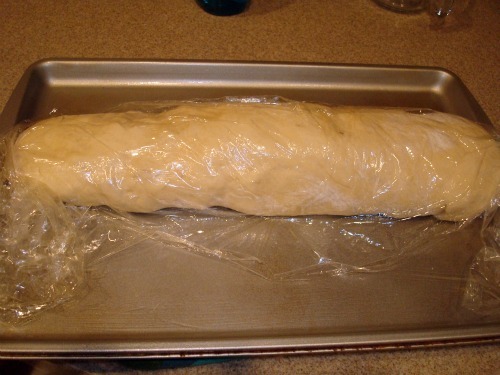 Cover the dough lightly with the oiled plastic wrap and let rest for 10 minutes. 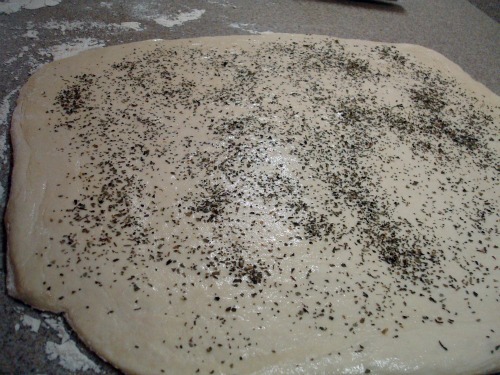 Spray a cookie sheet with nonstick baking spray. 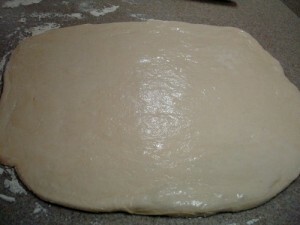 With floured hands, press the dough into a large square. 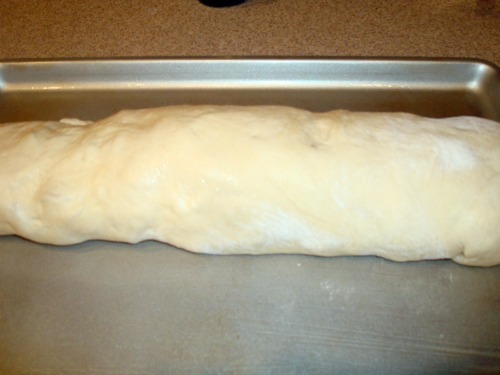 Using a floured rolling pin, roll it out into a rectangle (about 12 x 14). Brush the surface of the dough with some water, and then sprinkle the basil over the surface. 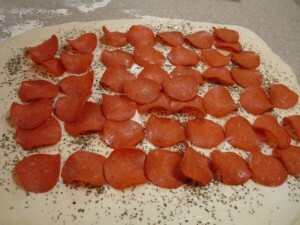 Lay the pepperoni in a single layer over the dough, leaving a 1-inch border on the edges. Starting at the long edge, roll up the dough and pinch the edges together to seal the seam. 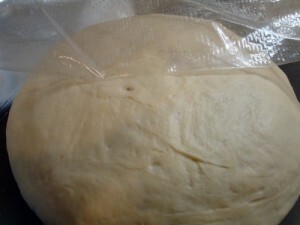 Transfer to a baking sheet (seam side down) and loosely cover with oiled plastic wrap. Let the dough rest for 15 minutes in a warm spot. Remove the plastic and bake for about 30 minutes, or until brown and crusty. 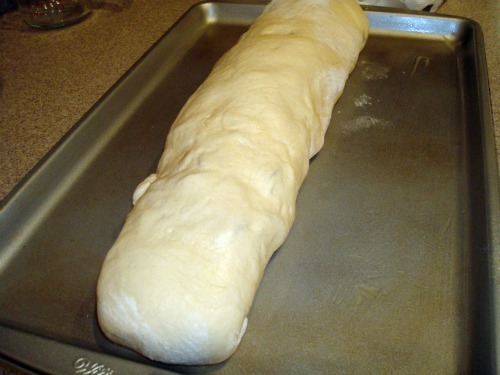 Transfer the bread to a wire rack and let cool for 20 minutes. 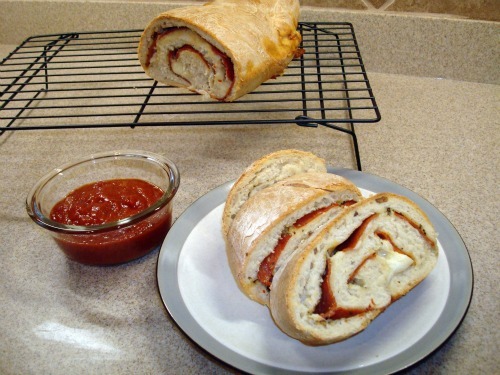 Cut into thick slices and serve warm with sauce on the side for dipping. 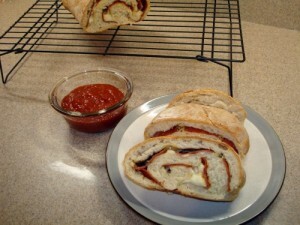 This entry was posted on Friday, June 3rd, 2011 at 10:09 am	and is filed under Recipes. You can follow any responses to this entry through the RSS 2.0 feed. You can leave a response, or trackback from your own site.